While the data finds that 8 out of 10 residents hail from within Devon, the lure of the new town – on the edge of Plymouth and nestled into the picturesque South Hams countryside – is appealing to people beyond the county too. Sherford has also attracted buyers from further afield, with over 20% relocating from other areas including Cornwall, Liverpool and Edinburgh. Four years since work started on the Sherford site, almost 250 homes have either been sold, reached exchange stage or have been reserved. It follows a homebuying surge through December, which was the busiest sales period Sherford has seen to date, which means many new residents are now joining the bustling new community on a weekly basis. Sherford residents have already used a variety of options to help them purchase their homes, with one Consortium member reporting that over a third of residents have used the Help to Buy scheme to buy their property. Other assistance schemes available at Sherford include shared ownership and military discounts. The knock-on effect of Sherford’s growth and thriving new community, is that the town’s first primary school is expanding too. Sherford Vale opened in September and has grown consistently since then. It now boasts 88 pupils in four classes and 22 nursery age children in a dedicated unit. It is the first of four schools in Sherford and will eventually have an intake of 420 pupils. 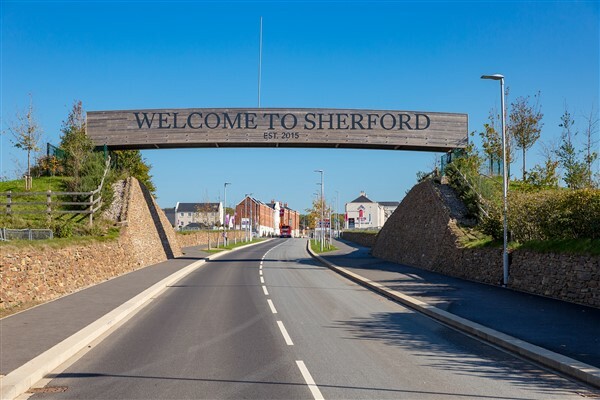 Bradley Davison, Managing Director, Sherford Consortium said: “Sherford is a community open to all and it has been fantastic to welcome so many new residents to the town – many of whom are local to the area. So many of the families living in the town have followed its development from the initial planning stages, sharing our vision and hopes for the future. Gary Streeter Member of Parliament for South West Devon said: "I have long believed that Sherford is going to be a wonderful place to live and as I see the houses coming out of the ground, the new school, the quality of the design, the green and pleasant backdrop and the Hight Street potential, so it is proving to be. Sherford will be a truly delightful place to live." Devon County Council Leader, John Hart said: "Sherford is providing much-needed homes in the area and I'm pleased to see that local people are benefiting from that. It's also encouraging that the school is growing at the heart of the community as more and more people move into Sherford."